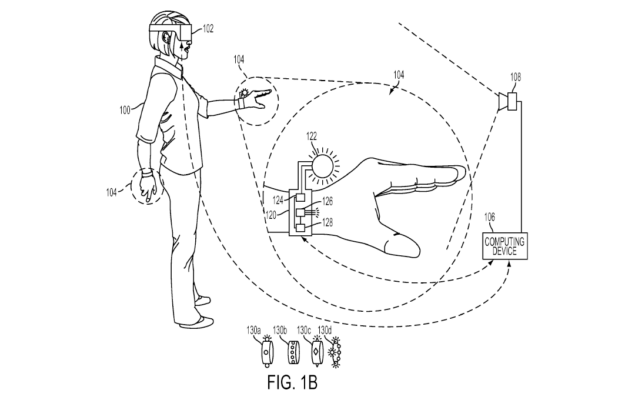 Sony filed a patent for a glove controller, likely to be used in conjunction with PlayStation VR. While the patent was submitted on October 17, 2014, it was only published yesterday by the US Patent & Trademark office. Here’s the abstract and a few highlights. A glove interface object is provided, comprising: at least one flex sensor configured to generate flex sensor data identifying a flex of at least one finger portion of the glove interface object; at least one contact sensor configured to generate contact sensor data identifying a contact between a first portion of the glove interface object and a second portion of the glove interface object; a communications module configured to transmit the flex sensor data and the contact sensor data to a computing device for processing to determine a finger position pose of the glove interface object, the finger position pose being applied for rendering a virtual hand in a view of a virtual environment on a head-mounted display (HMD), the virtual hand being rendered based on the identified finger position pose. The following embodiments provide a glove interface object and associated systems, methods, and apparatuses. In one embodiment, the methods, systems, image capture objects, sensors and associated interfaces objects (e.g., gloves) are configured to process data that is configured to be rendered in substantial real time on a display screen. For example, when a user’s hand changes positions (e.g., the hand moves, fingers bend, multiple fingers bend, fingers touch other fingers and/or gestures are made), the changes in positions are configured to be displayed in substantial real time on a display. The display may be the display of a head mounted display (HMD), a display of a second screen, a display of a portable device, a computer display, a display panel, a display of a remotely connected users (e.g., whom may be viewing content or sharing in an interactive experience), or the like. In some embodiments, the captured positions of the user’s hand, the pressures sensed, the fingers touched, and/or the hand/finger gestures are used to interact in a video game, in a virtual world scene, a shared virtual space, a video game character, a character that is an extension of the real-world user, or simply provide a way of touching, holding, playing, interfacing or contacting virtual objects shown on a display screen or objects associated with documents, text, images, and the like. In still other embodiments, virtual gloves may be worn by multiple users in a multi-user game. In such examples, each user may use one or two gloves. The users may be co-located or interfacing in a shared space or shared game from remote locations using a cloud gaming system, networked device and/or social networked collaboration space. In some embodiments, a glove may be used by one or more remote users to interact in a collaborative way to examine documents, screens, applications, diagrams, business information, or the like. In such an implementation, users collaborating may use their gloves to touch objects, move objects, interface with surfaces, press on objects, squeeze objects, toss objects, make gesture actions or motions, or the like. During collaboration, movements made by one user’s hand can appear to the other user as if a real user hand is moving things, objects, or making actions in the collaboration space. Still in a collaboration environment, if two remote users are examining documents, users wearing gloves can point at things on a virtual page, point and draw on a virtual whiteboard, lift and move virtual papers, shake hands, move items, etc. 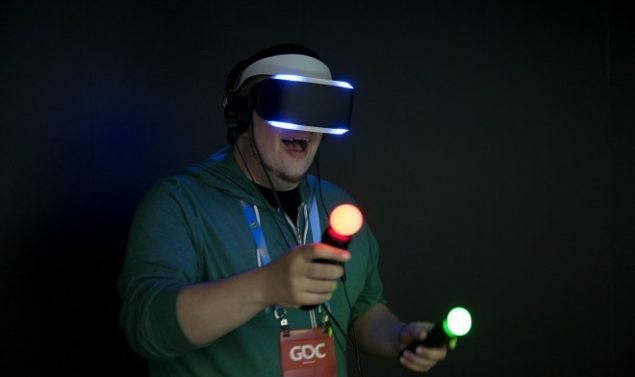 In some collaborative environments, one or more of the users may be wearing an HMD. When the HMD is used in conjunction with the glove or gloves (e.g., worn by one or more users), the users may see a virtual environment in which they can collaborate using their hands, such as moving objects, pages, objects, typing on virtual keyboards, moving virtual pages, tapping on things, pressing on things, etc. Therefore, it should be understood that the uses of a glove that includes one or more sensors, and/or can detect pressure, and/or can detect bending position of fingers, and/or can detect orientation, and/or can detect inertial movement, etc., can provide for a broad scope of uses. Example uses, without limitation, may include video gaming, entertainment activities, sport related activities, travel and exploring related activities, human-to-human contact (e.g., shaking hands of a remote user), business activities, etc. In one implementation, this type of interactivity provided by a glove interface may be extended to additional sensors that may be attached or associated with other parts of the human body (e.g., an arm, a leg, a foot, etc.). In addition to gloves, different types of clothes are envisioned, e.g., jackets, pants, shoes, hats, etc. FIG. 1A illustrates a system for interactive gameplay of a video game, in accordance with an embodiment of the invention. A user 100 is shown wearing a head-mounted display (HMD) 102. The HMD 102 is worn in a manner similar to glasses, goggles, or a helmet, and is configured to display a video game or other content to the user 100. The HMD 102 provides a very immersive experience to the user by virtue of its provision of display mechanisms in close proximity to the user’s eyes. Thus, the HMD 102 can provide display regions to each of the user’s eyes which occupy large portions or even the entirety of the field of view of the user. The user 100 may operate a glove interface object 104 to provide input for the video game. Additionally, a camera 108 can be configured to capture image of the interactive environment in which the user 100 is located. These captured images can be analyzed to determine the location and movements of the user 100, the HMD 102, and the glove interface object 104. In one embodiment, the glove interface object 104 includes a light which can be tracked to determine its location and orientation. Additionally, as described in further detail below, the HMD 102 may include one or more lights which can be tracked to determine the location and orientation of the HMD 102. The camera 108 can include one or more microphones to capture sound from the interactive environment. Sound captured by a microphone array may be processed to identify the location of a sound source. Sound from an identified location can be selectively utilized or processed to the exclusion of other sounds not from the identified location. Furthermore, the camera 108 can be defined to include multiple image capture devices (e.g. stereoscopic pair of cameras), an IR camera, a depth camera, and combinations thereof. In another embodiment, the computer 106 functions as a thin client in communication over a network with a cloud gaming provider 112. The cloud gaming provider 112 maintains and executes the video game being played by the user 102. The computer 106 transmits inputs from the HMD 102, the glove interface object 104 and the camera 108, to the cloud gaming provider, which processes the inputs to affect the game state of the executing video game. The output from the executing video game, such as video data, audio data, and haptic feedback data, is transmitted to the computer 106. The computer 106 may further process the data before transmission or may directly transmit the data to the relevant devices. For example, video and audio streams are provided to the HMD 102, whereas a vibration feedback command is provided to the glove interface object 104. In one embodiment, the HMD 102, glove interface object 104, and camera 108, may themselves be networked devices that connect to the network 110 to communicate with the cloud gaming provider 112. For example, the computer 106 may be a local network device, such as a router, that does not otherwise perform video game processing, but facilitates passage of network traffic. The connections to the network by the HMD 102, glove interface object 104, and camera 108 may be wired or wireless. FIG. 1B illustrates a system for interactive gameplay of a videogame, in accordance with an embodiment of the invention. A close-up view of a glove interface object 104 is shown. In some implementations, the glove interface object 104 can include a bracelet 120, having various devices and components defined therein. For example, the bracelet 120 can include a light or illuminated object 122, which can be tracked to identify the location and or orientation of the glove interface object in the interactive environment based on analysis of captured images of the interactive environment including the glove interface object 104. In one embodiment, the bracelet 120 includes a light controller 124 that is configured to control the operation of the light 122. By way of example, the color, intensity, on/off state, and other attributes of the light 122 can be controlled. 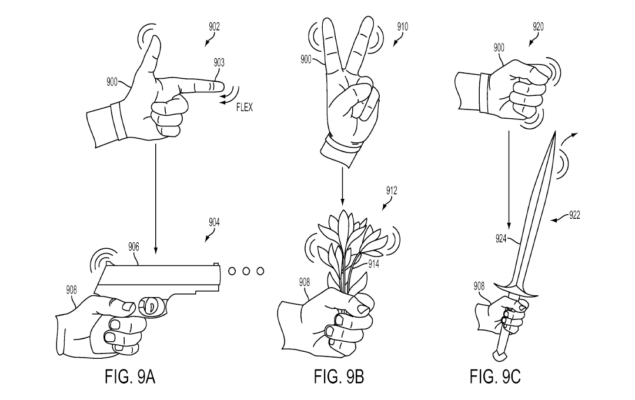 There are also a few images showcasing how the glove controller could be used in a videogame (though the patent explains that there could be several other uses not related to gaming), such as using it as a sword, pistol or flower. Glove controllers aren’t exactly revolutionary in and of themselves, but with the advancement in technology and the application in a VR environment things could definitely get interesting. Right now, PlayStation VR developers can choose either DualShock 4 or PlayStation Move; a glove could give them additional options when designing a game. Would you buy something like this? Let us know in the comments.